The Institute for Orthodox Christian Studies has announced details of this year’s summer school in Cambridge, which is to take place in Sidney Sussex College from 29 to 31 August 2016. The speakers at the conference will include Metropolitan Kallistos Ware, the Revd Professor Andrew Louth, the Romanian Orthodox theologian Dr Ciprian Streza, Dr Christoph Schneider of IOCS, and others. 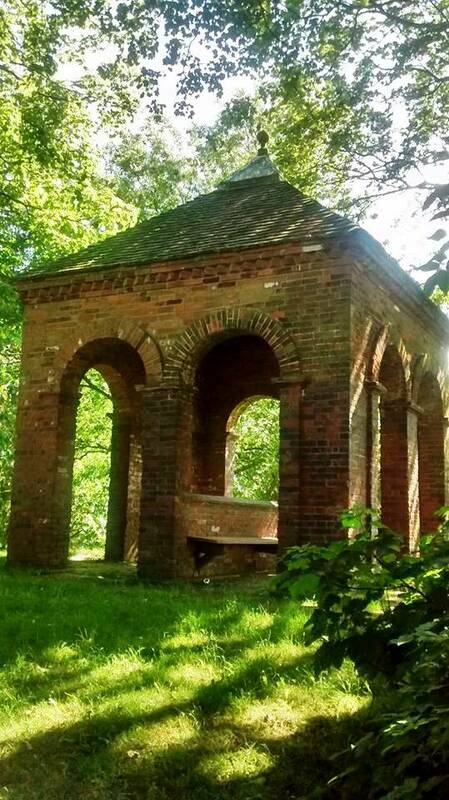 The last day of the conference will include a visit to the Monastery of Saint John the Baptist in Tolleshunt Knights, Essex, where participants will have a tour of the Monastery, along with a lecture from Sister Magdalen. The fees for the Conference will be about £340 (with meals) and £250 (without meals). More details will be available soon on the IOCS website. It is almost 20 years since I was invited to speak about the history and identity of the Church of Ireland to a group of German church leaders, who were visiting Ireland in 1998. I spoke in the Marino Institute of Education, but the visit from the Association of Protestant Ministers of the Diaspora in the Rhineland was so short, and I was brought in and out of their meeting so hastily, that I never had the opportunity to appreciate the setting or the surroundings in Marino. I was back in the Marino Institute yesterday [30 May 2016] for a day-long series of conversations with Archbishop Rowan Williams, and decided to walk there from the Mater Dei Institute of Education in Drumcondra. It was a bright, sunny, summer morning, and as I arrived at the Marino Institute I was impressed by the tree-lined surroundings on Griffith Avenue, and the driveway that leads up to the impressive gates that open into the Marino Institute. Charlemont, the name of the small housing estate nestling below these gates just off Griffith Avenue, provided a clue to the story of the site of the institute, even if the house that once stood there was demolished almost a century ago. A watercolour of Marino House by the Irish artist Edward McFarland in 1853 shows a conservatory with flowers. This picture is included in McFarland’s album of watercolours, A Drive from Dublin to Howth Returning by Clontarf. Another watercolour by McFarland in the same collection shows the Entrance Gate to Marino Demesne. It is the only representation of the main entrance gates in their original location, when they still opened into Charlemont’s demesne. In 1755, James Caulfeild (1728-1799), 1st Earl of Charlemont, returned to Ireland after his Grand Tour of classical sites in Italy and Greece. His step-father offered him an estate in Donnycarney that stretched down to the shores of Dublin Bay at Fairview. In creating his demesne, Lord Charlemont was strongly influenced by his experiences on the Grand Tour, from visits to antique Roman gardens to the poetry of Virgil and Horace. Perhaps the sea views reminded him of his Mediterranean tour when he renamed his estate Marino. In 1746, at the age of 18 year, he was sent on a Grand Tour of Europe, accompanied by the Revd Edward Murphy as his tutor. During his Grand Tour, which lasted almost nine years, he travelled to Holland and Germany, and spent a year in Rome and Naples before travelling on to Greece, where he was totally fascinated by the Parthenon in Athens and made drawings of the building long before it was pillaged destroyed by Lord Elgin. He visited Turkey and Egypt too before returning to Rome in 1750, where he met many famous people, including the Scottish architect Sir William Chambers (1723-1796), the sculptors Simon Vierpyl and Joseph Wilton and the artist and decorator Giovanni Battista Cipriani (1727-1785) from Florence. He spent vast sums of money collecting paintings, sculptures and books and shipping them back to Ireland. He returned to Ireland in 1755, and went on to build Marino House, the Casino in Marino, which is Dublin’s finest surviving neoclassical building, and Charlemont House in Dublin, now home to the Hugh Lane Gallery of Modern Art. Although bestowed with titles and honours, he disregarded court favours and formed a political alliance with Henry Flood and Henry Grattan. In 1780, as Lord Charlemont, he became the commander-in-chief of the Irish Volunteers, and in 1783 he presided at the Volunteer Convention in Dublin. From then on was known as the Volunteer Earl. 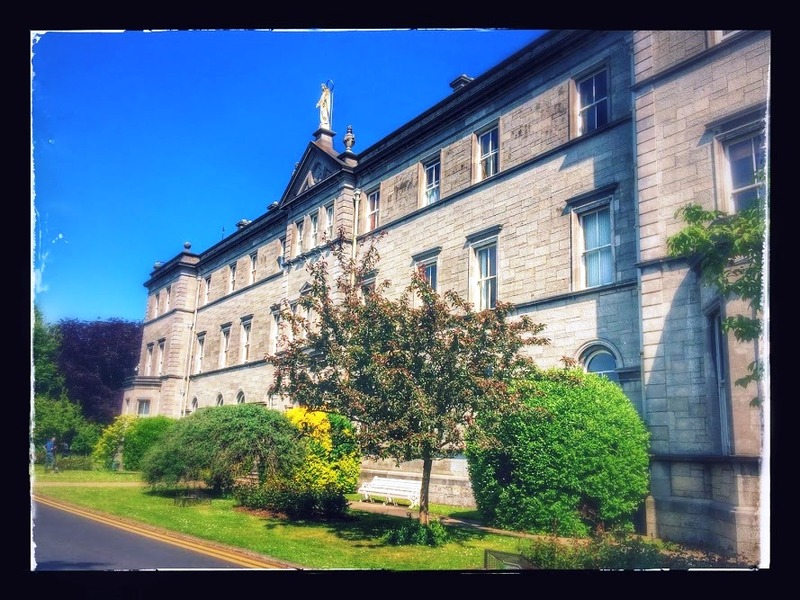 The main entrance to his estate on the north fringes of Dublin was in Fairview, later the site of Saint Joseph’s National School, where an imposing Doric gateway opened on to a long driveway to the house. The house was designed or remodelled by William Chambers and the gates were designed by Cipriani. In 1768, Chambers wrote to Charlemont, enclosing ‘Cipriani’s drawing for the dragons of the gate at Marino.’ The dragons feature on the Charlemont coat-of-arms, and the family motto, Deo Duce, Ferro Comitante (‘God as my leader, my sword my companion’) is also inscribed on the gates. Lord Charlemont hired Matthew Peters, a renowned gardener, to landscape his Marino estate in a type of ‘idealised Italian landscape’ – open and informal, with soft undulating lines offset by carefully positioned clumps of trees. There, until he died in 1799, Lord Charlemont lived a life of elegance and luxury. His titles and estates were inherited by his son, Francis William Caulfeild (1775-1863), 2nd Earl of Charlemont, who had been MP for Co Armagh until 1799. He died at Marino House in 1863. His four children pre-deceased him and his estate and titles passed to by his nephew, James Molyneux Caulfeild (1820-1892), the 3rd and last Earl of Charlemont. 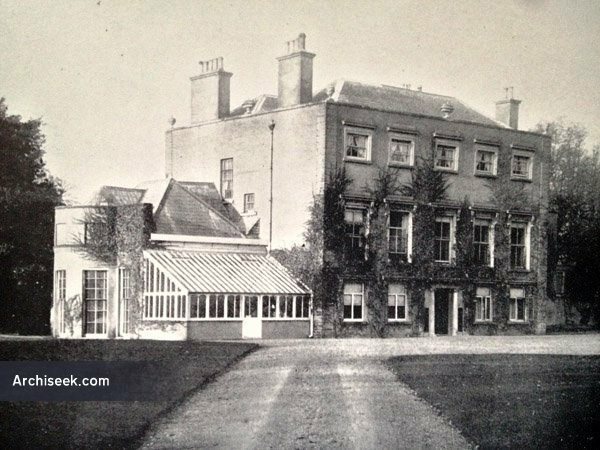 The Irish Christian Brothers bought Marino House, on the former Charlemont demesne, and made it their home. The last Earl of Charlemont died some years later in 1892 in Biarritz and was buried in Saint Patrick’s Cathedral, Armagh. A photograph from the late 19th century in the Lawrence Collection shows Marino House with a member of the Irish Christian Brothers standing outside. At the time, the Christian Brothers were using this former residence of Lord Charlemont as their quarters, until a new house named Saint Mary’s was built nearby in 1904. The population of Dublin was growing rapidly, and there was a pressing need for new housing. In 1924 a parcel of land belonging to the Christian Brothers’ parcel was acquired by a Dublin Corporation housing order for the Marino and Croydon Park Housing Scheme. Over the next two years, 1,283 houses were built on those 89 acres of land. In the process, Lord Charlemont’s old house was demolished, although his Casino still stands as an enduring monument to this Renaissance man. Lord Charlemont’s achievement in creating an earthly paradise at Marino was seen by him as his gift to posterity. Sadly, by the mid-20th century, almost all vestiges of this marvel had been lost, and in turn the memory of such a landscape at Marino was almost erased. The urns designed by Cipriani for Marino House stand on the roof of the Marino Institute to this day, on either side of a statue of the Virgin Mary. Cipriani’s gates have been saved and moved and now stand at the entrance to the Marino Institute of Education. Over these few mornings, I am reading the three poems written by Philip Larkin (1922-1985) in Lichfield in 1940, while his family was living at No 33 Cherry Orchard after the Coventry Blitz. Peter has repeated how Larkin once said of Lichfield: “God this place is dull.” But the three poems he wrote in Lichfield are anything but dull, although they were never published in his own lifetime. Philip Larkin was born in Coventry, the only son and younger child of Sydney and Eva Larkin. Sydney Larkin (1884-1948) was from Lichfield and his family’s long-standing associations with Lichfield date back to 1757. Some Larkin families lived at both No 21 and No 49 Tamworth Street, Lichfield, and the family graves are in Saint Michael’s Churchyard. Following the Coventry blitz, Sydney and Eva Larkin moved with their family to No 33 Cherry Orchard, Lichfield, and while he was in Lichfield, Philip Larkin regularly walked into the centre of Lichfield to drink in the George. During that time in Lichfield, Larkin wrote three poems: ‘Christmas 1940,’ ‘Ghosts’ and ‘Out in the lane I pause,’ which I was reading yesterday. In his lectures, Peter Young has suggested that Larkin may have referred to the Gazebo on Borrowcrop Hill in ‘Christmas 1940.’ During his ‘Lichfield Discovered’ talk in 2014, he said the arched field of ‘Christmas 1940’ refers to Borrowcop Hill. This poem was never published during Larkin’s own lifetime. It was first published in 1992 in Selected Letters of Philip Larkin, 1940-1985, edited by Anthony Thwaite (p. 8). It was included in 2005 by AT Tolley in Philip Larkin: Early Poems and Juvenalia (p 135), and more recently it is included by Archie Burnett in Philip Larkin: The Complete Poems (p 171). And looks down equally to all on earth. Summer has arrive. Or so half of the north-side Dublin seems to think. The temperatures in Dublin soared to 20 and a little above in the early afternoon. I had been in Christ Church Cathedral from early morning, preaching at the Cathedral Eucharist. As I stood outside the south porch door as the canon-in-residence for this week, greeting and welcoming visitors, the curious and the regular members of the congregation, I already felt that the sun was going to break through and that this was going to be a warm, bright and sunny Sunday. After coffee in the crypt, two of us emerged from the darkness below the cathedral into the sunshine. Initially, we had thought of having lunch in the city centre, and after yesterday’s busy day by the banks of the Shannon, we thought of snatching a few lazy hours in the back garden, sipping cold white wine. But this sunny Sunday afternoon seemed like an opportunity that was too good to be missed. And, to our chagrin, so did most Dubliners, it now appears. We were now looking forward to lunch at the Olive on Strand Street in Skerries, before a walk along the beach in the sunshine, followed, perhaps, by ice creams drizzled with double espressos at Storm in a Teacup on the pier, before another walk around the harbour. Little did we realise how are plans had been frustrated even before we got to Skerries. We managed to get into Skerries but soon realised that every street and laneway was being closed off for a cycling race. Every parking space had been taken or was blocked off. As we drove around in circles, we thought we could be circling for hours. Would we ever get out? Certainly there was no prospect of lunch, and even less prospect of those by-now badly-needed double espressos. Eventually, we found a gap near Holmpatrick Church, and headed south along the coast road. Although Loughshinny is beautiful, sunshine or no sunshine, there is nowhere for lunch, and certainly nowhere for double espressos. We parked outside the Thatch on Main Street in Rush, but found to our disappointment that it is closed. There was a paper promise in the window that it is going to reopen soon under new management. But obviously not this afternoon, and certainly not in time for much-needed coffee. Down at the harbour, there was no available parking wither. Not only were we not going to have lunch in Rush, but we were not going to have a walk on the beach there either. Ardgillan Castle in Balbriggan? Or Donabate? We eventually settled on Donabate. We stopped at Mrs Jones Farm Kitchen, at Ballymadrough, about 4 km from Donabate, close to Exit 4 on the M1. There the espressos are good, the panini are generous, and the sunshine made us feel exceptionally lazy as we lunched outdoors. We finally stirred ourselves, and headed east towards Donabate. Once again, the roads were clogged with traffic, not because of any cycle race, but simply because so many people had realised that was the best and sunniest afternoon we have had so far this year, and this was a day to be beside the sea. The queues for ice creams outside the shops in the village made me wonder whether more heat was being generated than would be sated by consuming the final purchases. Eventually, we found one of the few available parking spaces in new car park beside the Waterside Hotel, and walked down to the beach at Balcarrick. The beach was crowded with families, adults, children, babies and dogs. The tide was out, the golden sand was firm beneath our feet, the sea and the skies were blue, and some children were brave enough to make their way into the water. As we walked further south along the beach, towards the Malahide Estuary, the numbers of people began to thin out. If there had been some well-managed sunbeds, a few quiet beach bars, and someone walking up and down selling donuts and beer, this could have been a scene in the Mediterranean. Certainly, it was a glorious afternoon to be by the sea, and all our efforts were worth it. We returned home by another way … and there was still enough sunshine left in the early evening to enjoy that glass of cold white wine. Readings: I Kings 18: 20-21, 30-39; Psalm 96: 1-9; Galatians 1: 1-12; Luke 7: 1-10. Movie trivia is one of those subjects that make for great rounds in table quizzes. For example, it is said that when that great Biblical epic, The Greatest Story Ever Told, was being filmed half a century ago (1965), Telly Savalas shaved his head for his role as Pontius Pilate. He kept his head bald for the rest of his life, as we all know from the 1970s television series Kojak. The Swedish actor Max von Sydow said that the hardest part about playing Christ was the expectations people had of him to remain in character at all times. He could not smoke between takes, have a drink after work, or be affectionate with his wife on the set. 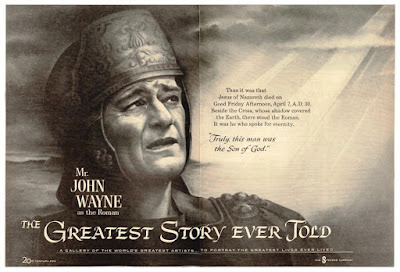 What did John Wayne really say, and did he say it with awe? But have you ever noticed how centurions show up frequently in the Gospels (see Luke 7: 1-10; Luke 23: 47; perhaps cf. Luke 3: 14), and in the Acts of the Apostles (see Acts 10: 1; 30-32, 42-44; 27: 1-3)? Roman soldiers and officials play such positive, even devout, roles in Luke and Acts that we have to ask why Saint Luke writes like this. So, for example, there is a series of devout centurions whose intervention at significant points leads to the furtherance of the Gospel. It is surprising that these figures in the Roman occupation are portrayed in such positive ways in the New Testament, including our Gospel reading this morning (Luke 7: 1-10). They respond to Christ by recognising his identity and, at times, with faith. In the seasons of the Church Calendar, we have moved into what we call Ordinary Time. And in Ordinary Time this year, our readings from Saint Luke’s Gospel tell us about Jesus dealing with ordinary people, in ordinary situations that each of us can identify with in our own ordinary, every-day, true-life situations. This morning’s Gospel story deals with some everyday questions that we all come across in our lives: compassion and healing, humanity and humility, power and authority, how employers treat the workforce, who is an insider in our society and who is an outsider? The first group of people who come to Jesus are some Jewish elders (see verse 3). They might not expect Jesus to have much time for a centurion. This man represents the foreigner, the outsider, perhaps even the oppressor. He does not share their language, their culture or their religion. We might expect these elders, probably Pharisees, to speak up only on behalf of someone of their own religion, even their own brand of religion. But the Jewish elders come to Jesus, not on behalf of the dying slave, but on behalf of the centurion. They come not on behalf of the powerless one, but on behalf of the powerful one. They speak up for him, not because he might return the favour … but because he has already done them favours. He has been not just kind and gentle, he goes beyond that – he loves the people. The word they use here is ἀγάπη (agape), love of the highest form, love that the New Testament sees as love for God and love for humanity. The second group of people sent by the centurion just as Jesus is near his house are the centurion’s friends (see verse 6). They would know that it was against Jewish custom for Jesus to enter a gentile’s, a Roman’s, a centurion’s home. Yet this story comes at a strategic place to show that this centurion is a man of good character. Immediately before this (Luke 6: 46-49), Jesus warns about the foolish man who builds his house on sand – the centurion, however, builds with eternity in mind. 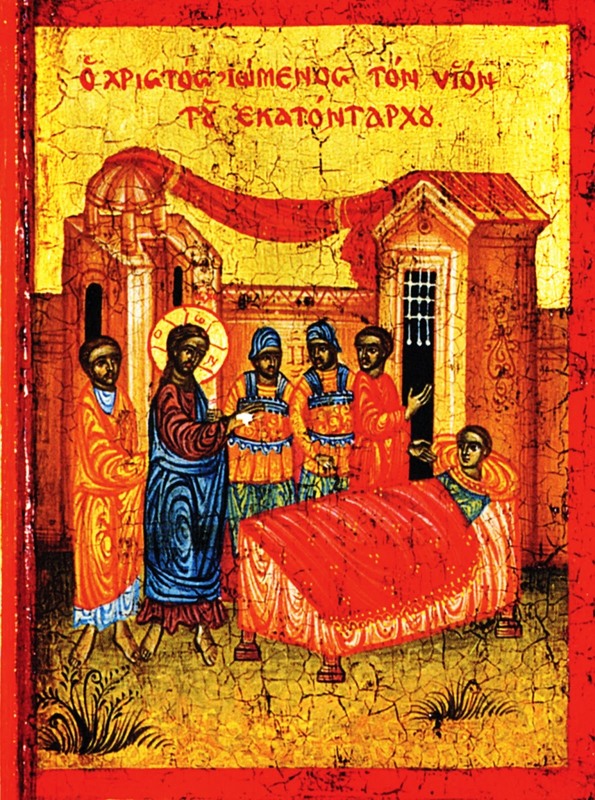 And immediately after (Luke 7: 11-17), we have the story of the widow of Naim and the death of her only son. The centurion, for his part, must surely know that despite what Jesus may do, the slave too will eventually die, even if in old age, so his only motivations can be love and compassion, like the love of a parent. This centurion can say do this, can say do that, but there is one thing he cannot do. He cannot give life itself. He recognises his limitations. He knows that he is dependent on Christ. In other words, he knows he is not self-dependent, he has to depend on God. He is a man of moving humility. The centurion in Capernaum is not Jewish, he is an outsider. We do not know how he prays, or how he lives, or how he worships. It is enough for the people of Capernaum, and for Jesus, that he loves the people. He builds a place for the people to worship, to learn and to meet. He cares for their needs, physical and spiritual. And Jesus responds to this deep and genuine agape. He goes to his house, where he finds a man of great love and compassion who truly has great faith. But why should we be surprised? I imagine this centurion already knew about Jesus and his disciples, and that Jesus and the disciples knew who the centurion was. It is probable that Capernaum was the hometown of Simon Peter, Andrew, James and John, as well as the tax collector Matthew. Earlier in this Gospel, we read how on one Saturday Jesus taught in the synagogue in Capernaum and then healed a man who was possessed by an unclean spirit (see Luke 4: 31–36). Afterwards, he also healed Simon Peter’s mother-in-law there (Luke 4: 38-39). When we have finished reading this morning’s Gospel story, we do not know the after-story. We do not know about the future faith of this centurion, whether he changed roles, changed his lifestyle, left politics and the army life behind him. We do not know. We do not know about the future of the slave. We know he is found in good health … but for how long? Did he live to old age? Did he gain promotion, or even his freedom? What about his later religious beliefs? We do not know. We do not know either what happens afterwards among the elders and friends sent out to Jesus. They arrive back late, after everything is over (see verse 10). But are they transformed? Do they move from respecting the centurion because of what he has done for him, to respecting him as an individual? Do they move from seeing him as an outsider to seeing him as an insider? Or will he remain on the margins, no matter how polite they may be about him … and no matter what Jesus does in his life? This surprising story tells us that those we perceive as our enemies, as outsiders, as strangers, as foreigners, can teach us so much about trust and faith. In the end, this story is reminiscent of Christ’s teaching in the previous chapter: “Love your enemies, do good to those who hate you” (Luke 6: 27). If we concentrate on healing and the miracle potential of this story, we may just sell ourselves short and miss the point of the story. Indeed, we know very little about the healing in this story, it tells us nothing about a healing ministry, it just tells us that when the elders and friends return to the house they find the slave is “in good health” (see verse 10). Perhaps the real miracle is to be found when we wake up to the reminder once again that Jesus is concerned for those we regard as the outsider, those we treat as the other, those we exclude. Who are our modern-day Gentiles? Those we describe as unbelievers, agnostics, atheists or secularists? These are the people the Church needs to listen to and to talk to today, just as Christ listens to the centurion’s delegates and friends, and eventually to the centurion himself. 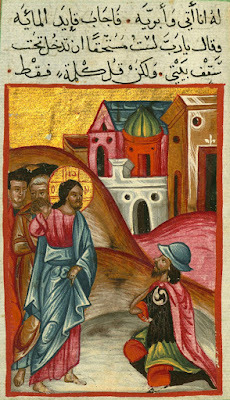 Jesus commends the faith of the centurion. He has seen nothing like it, even among his own people. He commends the centurion for his faith, and invites us to embrace that calling to live as people of faith. It is interesting in all of this that seemingly the slave is not aware of any of this. The slave plays a rather passive role in the story. So, we should note that Christ does not discriminate against the centurion, or against the slave. He makes no distinctions, no categorisation, allows no compartmentalisation. We do not know the religion, the ethnicity, the sexuality or the cultural background of the slave. Christ does not allow us to hold on to any prejudices or attitudes that tolerate racism, sexism, and ageism. We judge other people’s worthiness every time we withhold compassion or refuse to stand up for justice in solidarity with the oppressed, the ostracised, and the under-served. Will we take our cues from Christ and let God’s compassion and justice demolish the dividing lines we draw to protect ourselves? This story, which follows Saint Luke’s account of the Sermon on the Mount, challenges us to put the Sermon on the Mount into practice, to consider what it is to be a disciple of Christ, to place ourselves under his authority, which includes accepting his values so that we also value the other, the outsider. And so may all we think say and do be to praise, honour and glory of God, + Father, Son and Holy Spirit. Amen. (Revd Canon Professor) Patrick Comerford is Lecturer in Anglicanism, Liturgy and Church History, the Church of Ireland Theological Institute, and a canon of Christ Church Cathedral, Dublin. This sermon was preached at the Cathedral Coral Eucharist on 29 May 2016. 1 Ἐπειδὴ ἐπλήρωσεν πάντα τὰ ῥήματα αὐτοῦ εἰς τὰς ἀκοὰς τοῦ λαοῦ, εἰσῆλθεν εἰς Καφαρναούμ. 2 Ἑκατοντάρχου δέ τινος δοῦλος κακῶς ἔχων ἤμελλεν τελευτᾶν, ὃς ἦν αὐτῷ ἔντιμος. 3 ἀκούσας δὲ περὶ τοῦ Ἰησοῦ ἀπέστειλεν πρὸς αὐτὸν πρεσβυτέρους τῶν Ἰουδαίων, ἐρωτῶν αὐτὸν ὅπως ἐλθὼν διασώσῃ τὸν δοῦλον αὐτοῦ. 4 οἱ δὲ παραγενόμενοι πρὸς τὸν Ἰησοῦν παρεκάλουν αὐτὸν σπουδαίως, λέγοντες ὅτι Ἄξιός ἐστιν ᾧ παρέξῃ τοῦτο, 5 ἀγαπᾷ γὰρ τὸ ἔθνος ἡμῶν καὶ τὴν συναγωγὴν αὐτὸς ᾠκοδόμησεν ἡμῖν. 6 ὁ δὲ Ἰησοῦς ἐπορεύετο σὺν αὐτοῖς. ἤδη δὲ αὐτοῦ οὐ μακρὰν ἀπέχοντος ἀπὸ τῆς οἰκίας ἔπεμψεν φίλους ὁ ἑκατοντάρχης λέγων αὐτῷ, Κύριε, μὴ σκύλλου, οὐ γὰρ ἱκανός εἰμι ἵνα ὑπὸ τὴν στέγην μου εἰσέλθῃς: 7 διὸ οὐδὲ ἐμαυτὸν ἠξίωσα πρὸς σὲ ἐλθεῖν: ἀλλὰ εἰπὲ λόγῳ, καὶ ἰαθήτω ὁ παῖς μου. 8 καὶ γὰρ ἐγὼ ἄνθρωπός εἰμι ὑπὸ ἐξουσίαν τασσόμενος, ἔχων ὑπ' ἐμαυτὸν στρατιώτας, καὶ λέγω τούτῳ, Πορεύθητι, καὶ πορεύεται, καὶ ἄλλῳ, Ἔρχου, καὶ ἔρχεται, καὶ τῷ δούλῳ μου, Ποίησον τοῦτο, καὶ ποιεῖ. 9 ἀκούσας δὲ ταῦτα ὁ Ἰησοῦς ἐθαύμασεν αὐτόν, καὶ στραφεὶς τῷ ἀκολουθοῦντι αὐτῷ ὄχλῳ εἶπεν, Λέγω ὑμῖν, οὐδὲ ἐν τῷ Ἰσραὴλ τοσαύτην πίστιν εὗρον. 10 καὶ ὑποστρέψαντες εἰς τὸν οἶκον οἱ πεμφθέντες εὗρον τὸν δοῦλον ὑγιαίνοντα. 9 When Jesus heard this he was amazed at him, and turning to the crowd that followed him, he said, “I tell you, not even in Israel have I found such faith.” 10 When those who had been sent returned to the house, they found the slave in good health. 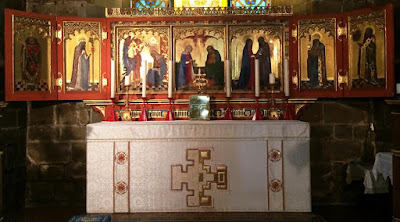 We have had a series of post-Easter celebrations with a high note in recent weeks, from Pentecost through Trinity Sunday and Thursday’s celebration of Corpus Christi. This morning [29 May 2016], on the First Sunday after Trinity, we find ourselves truly in Ordinary Time, and for the next few Sundays the readings from Saint Luke’s Gospel are about Christ’s compassion for ordinary people, in their ordinary lives, with the crises and difficulties that confront us all in our ordinary lives. I am the canon-in-residence in Christ Church Cathedral, Dublin, this week, and later this morning I am preaching at the Cathedral Eucharist, when the readings are: I Kings 18: 20-21, 30-39; Psalm 96: 1-9; Galatians 1: 1-12; Luke 7: 1-10. The Precentor, Canon Neil McEndoo, is presiding at the Eucharist, and the setting is Igor Stravinsky’s Mass composed in 1944-1948. At the time, he was writing his Symphony, Ebony Concerto, Concerto in D, and the ballet Orpheus. The Russian composer Igor Fyodorovich Stravinsky (1882-1971), who was later a naturalised French and American citizen, is widely regarded as one of the most important and influential composers of the 20th century, and his best-known works include The Rite of Spring (1913). Music praises God. Music is well or better able to praise him than the building of the church and all its decoration; it is the Church’s greatest ornament. This setting is said to exhibit the austere, Neoclassic, anti-Romantic aesthetic that characterises Stravinsky’s work from about 1923 to 1951. But why, as a devout member of the Russian Orthodox Church, did Stravinsky write a setting for the Western Mass? This is one of only a handful of pieces by Stravinsky that was not commissioned. Is there a parallel between this devout Orthodox believer writing a Mass setting and the Roman centurion in this morning’s Gospel reading (Luke 7: 1-10) who builds a synagogue for the devout Jews of Capernaum? My Mass was partly provoked by some Masses of Mozart that I found at a second-hand store in Los Angeles in 1942 or 1943. As I played through these rococo-operatic sweets-of-sin, I knew I had to write a Mass of my own, but a real one. I wanted my Mass to be used liturgically, an outright impossibility as far as the Russian Church was concerned, as Orthodox tradition proscribes musical instruments in its services – and as I can endure unaccompanied singing in only the most harmonically primitive music. One composes a march to facilitate marching men, so with my Credo I hope to provide an aid to the text. The Credo is the longest movement. There is much to believe. The image of marching men expressing their faith through Stravinsky’s Credo certainly evokes images of the centurion in this morning’s Gospel reading and his account of the men and slaves he commands, which is balanced by the faith he expresses in Christ as Lord. In addition, the Motet during Communion this morning is The Angelic Salutation by Stravinsky, and we have hymns and music too by Percy Dearmer, Orlando Gibbons, John Chadwick, William Maclagan, Josiah Conder, Samuel Sebastian Wesley and Samuel J Stone. When I am back in Lichfield, I often stay in the Hedgehog Vintage Inn, on the northern edges of the cathedral city. 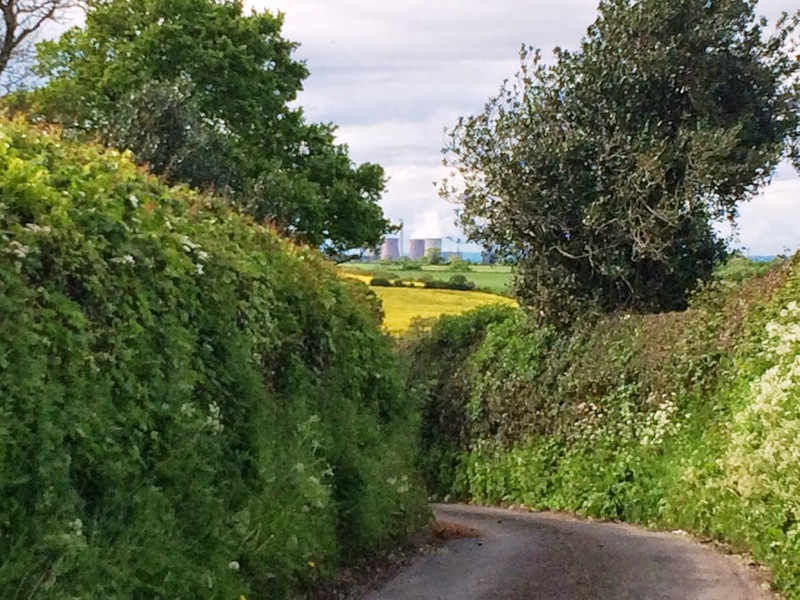 The Hedgehog stands on a hill, with sweeping views across the countryside, and across to the three spires of Lichfield Cathedral. 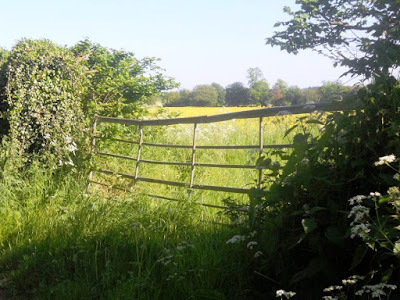 Below the bank on one side of the grounds of the Hedgehog is Cross in Hand Lane, a meandering country lane that leads out into open countryside, with fields and brooks, leading north to the villages of Farewell and Chorley. But Cross in Hand Lane also marks the ancient pilgrim route between the shrine of Saint Chad in Lichfield and the shrine of Saint Werburgh in Chester. Both saints had Irish connections – Saint Chad is said to have been trained in an Irish monastery, and Saint Werburgh was a popular saint in mediaeval Dublin – but I have often thought this pilgrim route has the potential to be England’s very own camino. Recently, I received a beautifully produced and well-researched guide to this English camino. 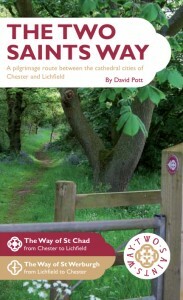 The Two Saints Way by David Pott, published last year , is a guide to this pilgrimage way. David Pott is an experienced long-distance walker and the key person in developing the idea of the Two Saints Way. When David and his wife Pam came to Stone in the autumn of 2007, he became interested in the foundational story of the town and the legend of the two princes Saint Wulfad and Saint Rufin. The story features both Saint Chad and St Werburgh. Apart from various sites in Stone, however, he found connections with the legend in other places in the Trent Valley between Trentham and Salt, including a Saxon hill fort at Bury Bank (formerly called “Wulpherecestre”) and Saint Rufin’s Church in Burston. David first thought of linking together these sites in a trail between Trentham and Stafford. But soon there was a suggestion of extending the story trail from Stafford to Lichfield over Cannock Chase along the Heart of England Way. Then David was heard about the mediaeval pilgrim route between Chester Cathedral and Lichfield Cathedral. Many pilgrims on this route would have continued to Canterbury or even on to Rome or Jerusalem. He began thinking about linking existing paths to create a revived pilgrimage route between the two cathedral cities. At first, he called this the Saint Chad’s Way Project. But the idea grew and an early support group became a steering group. With the discovery of the Staffordshire Hoard in 2009, there was a new interest in the heritage of Mercia, and the name of Two Saints Way was adopted in June 2010. The inaugural pilgrimage along the Two Saints Way took place in March 2012. Since then, work has continued on signing the setting up interpretation panels. This colourful and practical guidebook was published last year [November 2015]. Preparing the guidebook was a lengthy process that included assembling photographs and finalising maps. Inevitably, changes took place along the route, such as kissing gates replacing stiles. And there has been in upsurge in interest in the pilgrim route. The Two Saints Way now has a team of volunteer local co-ordinators to oversee each section of the route in their locality, making sure the footpaths are clear and the signs stay in place. The maps and instructions in this book are clear and helpful, and the book is a beautifully presented and attractive invitation to set out on this pilgrim route. There is a wealth of practical detail and information, with interesting and inspiring content. The book has a cover price of £12.99 (ISBN 9781910786215). I bought mine through the Lichfield Cathedral Shop at No 9, The Close, Lichfield. Find out more about this interesting pilgrim route here. I was back in Tamworth recently to see the sorry state of the Moat House, the former Comberford family home on Lichfield Street, and to update my file of photographs of the Comberford Chapel in Saint Editha’s Church. 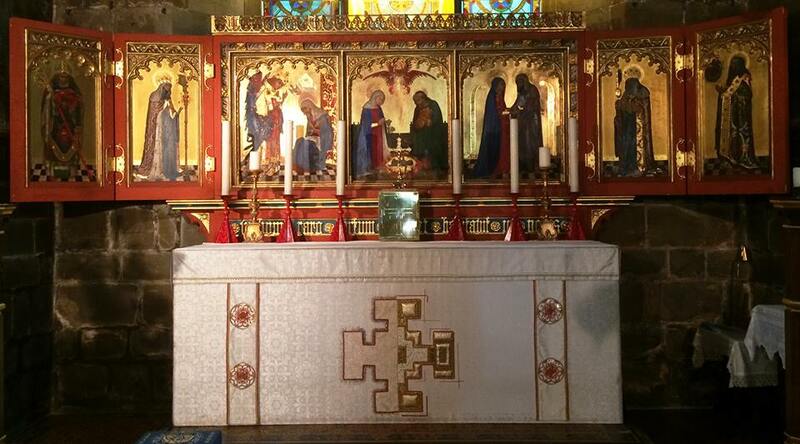 I was writing yesterday [27 May 2016] about the Victorian restoration of Saint Editha’s by the Gothic revival architect Sir George Gilbert Scott, and the many Gothic Revival, Pre-Raphaelite and Arts and Crafts treasures in the church, including the reredos by Sir George Gilbert Scott, John Birnie Philip and Antonio Salviati, and windows by William Wailes, Sir Edward Burne-Jones, William Morris, Henry Holiday, James Powell and the Whitefriars Studio and Ford Madox Ford. There are two Comberford monuments in the parish church, but the church is filled with monuments and memorials connected with the Marmion, Freville and Ferrers families of Tamworth Castle. Inside the west porch, a large, colourful and impressive monument reveals an interesting link between the Ferrers family of Tamworth Castle and the Butler family of Kilkenny Castle. This extravagant monument once stood against the north wall of the chancel, close to the Altar, but was probably moved to the west porch when the church was being renovated and restored in the 1850s by the great Gothic revival architect, Sir George Gilbert Scott. The monument is a memorial to Sir John Ferrers (1629-1680) of Tamworth Castle, MP for Derbyshire and later for Tamworth in the Restoration Parliament, who died in 1680, and to his son, Sir Humphrey Ferrers, who was drowned two years earlier in the River Trent. Their memorial is an exuberant, garlanded riot of polished marble, complete with renaissance cherubs and colourful coats-of-arms. The elaborate Latin inscription is held up by two life-size statues of a man and a woman, dressed in the senatorial togas of imperial Rome and bedecked with the flowing wigs that were fashionable in Renaissance England. The monument is the work of the sculptor and woodcarver Grinling Gibbons (1648-1721) and the Flemish sculptor Arnold Quellin (1653-1686). Gibbons was a master carver to kings and queens and was known primarily for his work in wood. His patrons included Charles II, James II, William III, Queen Mary, Queen Anne and George I. In Tamworth, he displays the depth, sharpness and intricacy of work that made him one of the outstanding craftsmen of his age. The statues are the work of the Danish sculptor Caius Gabriel Cibber (1630-1700), who also worked closely with the architect Sir Christopher Wren in London. The Latin inscription was composed by the historian and antiquarian Sir William Dugdale (1605-1686), who was born near Tamworth at Shustoke, near Coleshill, Warwickshire. It is interesting to note that Dugdale’s inscription boasts of no particular qualities or achievements for John Ferrers. His political career was marked by fence-sitting, he was never diligent in attending Commons debates or parliamentary committees, and when he contributed he was often misogynist in his views. Instead, this epitaph lists the families he was related to by ancestry and marriage, as though they were glorious achievements worthy of praise. Here lies Sir John Ferrers of Tamworth Castle, the only son of Sir Humphrey Ferrers, the male heir of the line of the ancient Ferrers (formerly Earls Ferrers and Earls of Derby) and notably the last of their branch of the family. Which son John, through the female line, was linked to the de Frevill, Marmion, Mountford and Botetort families, once barons of the kingdom. By his wife Anne, daughter of Sir Dudley Carleton, recently one of the advisers, from the innermost counsels, to the most illustrious King Charles, he reared only one son, Sir Humphrey, and a daughter Dorothy, who married Richard Earl of Arran (of the Irish peerage) the second son of the most noble James, Duke of Ormonde. He died on 14 August 1680 aged 52. Close by lies Sir Humphrey Ferrers, only son of the above mentioned John, who married Elizabeth, daughter of Gervase Pigot of Thrumpton in Nottinghamshire, by whom he had one surviving daughter, called Ann. He died on 6 September 1678, while his father was still living, aged 25 years. Richard Butler (1639-1686), 1st Earl of Arran, who also held the title of Viscount Tullough and Baron Butler of Cloughgrenan, was an Irish peer, the fourth son of James Butler, 1st Duke of Ormonde. But how did a Butler from Kilkenny, with family connections with Tamworth, come to own the Arran Islands in Galway Bay? In 1651, at the height of the Cromwellian wars, the head of the Burke family, Lord Clanricarde, placed 200 musketeers on the Arran Islands, under the command of Sir Robert Lynch. The fort on Inishmore was rebuilt and fortified, and the Irish royalist forces held out against the Cromwellian parliamentary forces for almost 12 months after the surrender of Galway. The islands eventually surrendered on condition that quarter should be given to all the soldiers who had garrisoned the fort, and that they would have six weeks to make their way to Spain. Sir Robert Lynch was declared a traitor and the islands were granted to Erasmus Smith, the founder of charter schools in Ireland. Smith sold the Arran Islands to Richard Butler, a younger son of James Butler, 1st Duke of Ormonde, and in 1662 Richard was given a number of titles, including Earl of Arran, Viscount Tullogh and Baron Butler of Cloughgrennan. Almost a decade later, as a reward for his role in naval battles against the Dutch, Richard was also given an English peerage with the title of Baron Butler of Weston. Richard Butler was married twice. His first wife Mary (1651-1668) was a daughter of James Stewart, 1st Duke of Richmond, and a cousin of Charles II. They had no children, and when she died in 1668 he married his second wife, Dorothy Ferrers, daughter of John Ferrers of Tamworth Castle and his wife Anne, daughter of Sir Dudley Carleton. Richard Butler from Kilkenny and Dorothy Ferrers from Tamworth were the parents of four children, including three sons who died in infancy, and who one after another had been given the courtesy title of Lord Tullogh: James Butler (1674-1676), Thomas Butler (1675-1681) and Thomas Butler (1681-1685). Their only surviving child, Lady Charlotte Butler (1679-1725), married Charles Cornwallis (1675-1722), 4th Baron Cornwallis. Richard Butler died in 1686, six years after his father-in-law, John Ferrers of Tamworth Castle. Richard had no male heirs to inherit his titles, and so they died out. They were revived in 1693 for his nephew Charles Butler (1671-1758), who became Earl of Arran, Viscount Tullough and Baron Butler of Cloughgrenan. Charles Butler was a brother of the 2nd Duke of Ormonde and the de jure 3rd Duke of Ormonde. He too died without any male heirs to inherit the titles, and so they became extinct once again in 1758. In 1762, the title of Earl of Arran was revived in favour of Sir Arthur Gore, whose descendants still hold the title, while the Arran Islands in Galway Bay eventually were bought by the Digby family. Meanwhile, Lady Charlotte Butler’s eldest child, Charles Cornwallis (1700-1762), became the 1st Earl Cornwallis. One of her younger sons, Frederick Cornwallis (1713-1783), became Bishop of Lichfield in 1750 and ended his days as Archbishop of Canterbury (1768-1783). Cornwallis rose quickly in the Church because of his political his aristocratic connections. In 1750, he became a canon at Saint Paul’s Cathedral, and later that year he became Bishop of Lichfield (1750-1768). While he was Bishop of Lichfield, he was also Dean of Windsor (1765-1768) and Dean of Saint Paul’s Cathedral, London (1766-1768). As Archbishop of Canterbury, he supported the North administration and also supported Anglican clergy who were dispossessed in the colonies during the American Revolution. But while Cornwallis was a competent administrator, he was an uninspiring Church leader, and his lack of zeal paved the way for the emergence of both the Evangelicals and the Oxford Movement in the century that followed. While Archbishop Cornwallis was still Archbishop of Canterbury, his nephew also became Bishop of Lichfield. James Cornwallis (1743-1824) was the third son of Charles Cornwallis, 1st Earl Cornwallis, and a grandson of Lady Charlotte Butler. He was a Prebendary of Westminster Abbey (1770-1785) and the Dean of Canterbury (1775-1781) when he became Bishop of Lichfield (1781-1824). While he was Bishop of Lichfield, he was also Dean of Windsor (1791-1794) and Dean of Durham (1794-1824). Shortly before his death, he became 4th Earl Cornwallis at his nephew’s death in 9 August 1823, and held the title for about five months until he died on 20 January 1824. As for the Ferrers estates in Tamworth, Sir John Ferrers left an estate valued at £2,000. Tamworth Castle and his other properties eventually passed from one daughter to another, through the Shirley, Compton and Townshend families. In 1767, when the Townshend family came to live at Tamworth Castle, they also bought the Moat House, the former Comberford family home on Lichfield Street.